Bright Idea Jerry McKay focuses his marketing efforts on existing clients, who account for 55 percent of sales. Insights from the fourth annual The Lighting Summit, hosted by McKay Landscape Lighting. When it comes to your marketing scheme, “don’t walk over dollars to get to pennies,” says McKay Landscape Lighting Owner Jerry McKay. Marketing was the theme at The Lighting Summit, held Jan. 18-19 in Omaha, Neb. 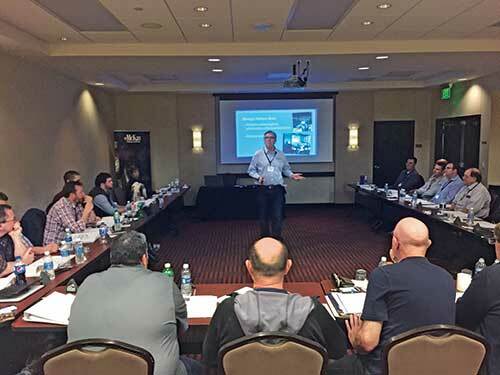 For the fourth annual event, McKay Landscape Lighting—which performs 100 percent landscape lighting services to a mostly residential clientele—welcomed 21 landscape lighting professionals from 19 companies. Educational sessions included interacting with the media, building your website into an effective online storefront and an inside look at McKay Lighting’s in-house marketing strategy. McKay Landscape Lighting’s marketing plan, which the company handles in-house, concentrates on three segments: new customers, strategic partnerships and existing customers. While strategic partners, such as construction and design/build+installation companies, and a steady stream of new customers are essential, one area not to forget is the existing customer base, McKay says. His company draws 55 percent of yearly sales from existing or past customers. Strategic partners bring in 24 percent and new customers account for 21 percent of sales. For example, one McKay customer had halogen lights installed 10 years ago. After five years, the customer added a patio to his home and hired McKay to illuminate the space with string lighting. Last year, McKay sold the customer on the benefits of LED lights. He decided to upgrade his decade-old setup to an LED one. Satisfied, he asked McKay to look at his second home out of state. This year, McKay will tackle that project. Without generating one new lead, the company sold four projects in 10 years. Plus, with an upgrade, the customer essentially hired the company to maintain the system for the next several years, which brings in an extra $5,000 a year, he says. McKay says frequent marketing interactions and reminders drove the additional business. “He paid attention to social media and to what Danielle (Hagemeier, the company’s in-house marketing director) is doing on the blog, discussing the benefits of upgrades,” he says. The company didn’t always focus on existing customers. Before it tracked sales closely, McKay Lighting spent nearly 70 percent of its marketing budget attracting new customers. Today, the company has reallocated funds, spending about 50 percent of the marketing budget on existing clients. Much of this approach centers on social media, email blasts and producing blog content. These campaigns are often cheaper than other methods, taking little more than man-hours. The company also produces a slew of print materials, like holiday cards and calendars featuring McKay Landscape Lighting projects. One campaign that worked well was a side-by-side photo of a home before and after it was upgraded from halogen to LED lights. The company even found success using YouTube videos to educate customers about how to fix certain elements of their systems and other customer education efforts. “You need to at least continue to have a dialogue with your existing client and analyze where your marketing dollar goes,” McKay says. An added benefit, selling to and dealing with existing customers is much easier, McKay says. If the company gets a bid in front of an existing customer, it’s almost a sure deal. For one, existing clients are savvier. Questions like “How long will the ground will be torn up?” are already answered. Veteran customers experience less sticker shock, as they know what lighting projects cost and understand the value they bring to their property. On the operational side, there are few surprises. Crews already know where the transformer is and where wire is laid. In an upgrade, the project is mostly planned. It’s merely a face lift, done by replacing equipment. A typical job is just a little bit of rewiring and plugging back into the existing transformer.